Keyi Zeliang, is a gospel singer from Dimapur who started singing at a very young age. 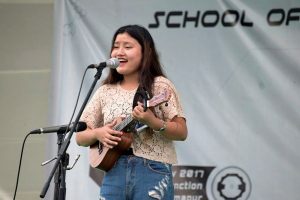 Keyi Zeliang who mostly performs with her ukulele is an active YouTuber and uploads only secular songs but has plans to make her page a gospel one in days to come. Keyi says, she was also invited to contest for India’s next superstar auditions during the year 2016. 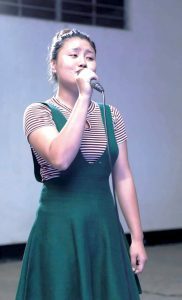 In today’s Rhythm of Love, Keyi Zeliang shares her musical journey. Eastern Mirror: How would you like to introduce yourself to those who haven’t heard of you yet? Keyi Zeliang: Hello, my name is Keyi Zeliang from Dimapur Nagaland. Eastern Mirror: An insight of how your musical journey started. 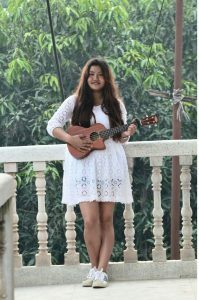 Keyi Zeliang: I have always loved to sing from early young age but my inspiration for music actually started when I was invited to contest for India next superstar auditions back in 2016. 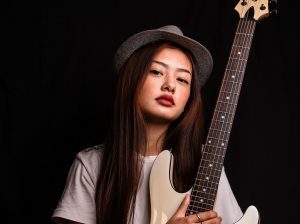 Keyi Zeliang: My inspiration is to sing and stand for the voice that God has gifted me and inspire others through music . Eastern Mirror: What do you think is needed for the talented musicians of the state to compete with the rest of the world? Keyi Zeliang: I think the need for musicians of our state is to stand up with pride and never lose hope, and create one’s own melody. And I think being a Christian state musicians first inspiration should be to sing gospel songs and glorify His name. Eastern Mirror: Have you had any formal music training? Keyi Zeliang: I first took vocal and keyboard training from Candy Jam music school in Burma camp . Eastern Mirror: Being a YouTuber, what advice do you have for those who wish to follow your interest? Keyi Zeliang: Being a Youtuber, I would like to advice those who show love and kindness and want to lift up their dreams just remember that nothing in life in beyond repair; so don’t lose hope cause even if you’re on the right track, you’ll run over it if you just sit down. Eastern Mirror: Top 5 tracks in your playlist. And the one song that always stays in your heart. Keyi Zeliang: One song really inspired me and stay in my heart is “well done” .This song really push me high and higher even if sometimes I lost hope getting bad comments from friends and others or sometimes difficult task beings into music field. This song by Moriah Peters pushes me and encourages me that whatever tasks I’m doing for the world, God is always there to say well done. Eastern Mirror: If given a ‘wish’ to choose a profession, what would you choose and why? Keyi Zeliang: I am a theologian by profession. Being brought up in a Christian family and having a profession for theology doesn’t only mean preaching about God’s words but also singing and praising His name.